Walt Disney's first film series. Short, typically only a minute long, these were entirely made by Disney. These were usually live-action with a limited bit of animation in them. These were produced for exclusive showings in Kansas City's Newman Theatres. They proved to be the stepping stone to the fully-animated and crewed Laugh-O-gram series. 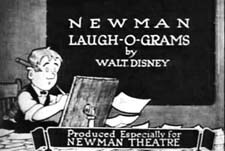 Newman Laugh-O-grams by Big Cartoon DataBase is licensed under a Creative Commons Attribution-NonCommercial-ShareAlike 4.0 International License.